Sorry Naruto, you deserved better. This anime has great canon. Since it is based on the manga, the story in itself is great. HOWEVER, most of this anime is filler. When you think you're getting to a climax in a storyline... you get 15 filler episodes. EVERY. DAMN. SEASON. The manga is now over. THEY CAN BRING THE SHOW TO A CONCLUSION. They won't however. Instead, they greatly degrade the quality of a once good anime with almost completely unwatchable filler storylines. In fact, there is soo much filler, after waiting month after month after month for the actual canon (the reason for this anime), I've completely withdrawn from the story to the point where I simply don't care and have to rewatch episodes from 3 months ago to remember wtf is going on. The anime company destroyed what could have been the greatest anime in existence. Like spray painting a stickman body on the Mona Lisa to make it a larger picture. Empty, useless, boring episodes usually follow a good canon episode and after almost a decade of this pattern I must say, read the manga instead. It is way better and won't disappoint since (again) the story really is one of the best. I'm sad to see Naruto end, but happy as well, since the longer fillers continue (even at the end), the more of a "milking the cow" scenario this becomes. I started watching Naruto back in 2003. I'm now in 2014 and still watching! I grew up on it and it really does teach great values in it's story and the character development. Naruto single handedly brought me into all the other anime, such as Bleach, Death Note, InuYasha, etc. The story is truly original and so in depth it'll surprise you how far it goes. Naruto turns from punk to protector of his village throughout the years this show has been going on. This anime has it all: Romance, Action (OF COURSE), Great fighting scenes too, music is top notch and so are the voice overs. It's truly been an amazing ride and I will definitely miss it when it's gone, but it's gotta end sometime. To anyone new to this series: Get into it ASAP, you won't regret it! There can never be one like it. If you have never read this Manga or watched this Anime i recommend you stop reading reviews and get to watching because you are definitely missing out. Ive been watching Naruto since i was 8. 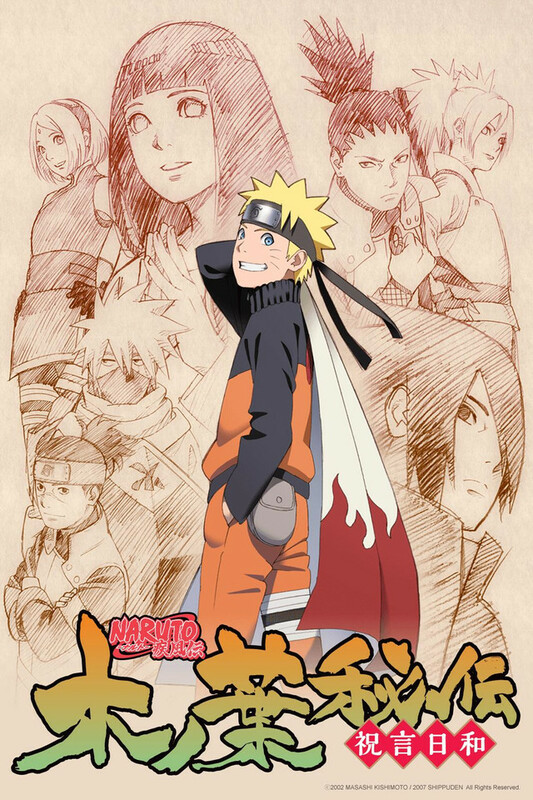 As i kid i saw it as more of a humorous funny anime but as i got older and Shippuden came out i got to experience the depth of the Naruto Mange and Anime. Naruto Shippuden puts all the pieces together of every story line so well it keeps you in, as i did me....i would say until it ended (Chapter 700 came out 2 weeks ago) But Naruto:The last is said to come to theaters in Japan on 12/6/14 and im beyond excited about that. Even after Naruto:The last comes out i will always come back to re-read and re-watch Naruto and Naruto shippuden, I am a mother now and introduced my daughter to the series as soon as she started paying attention to the content in TV shows. We watch it everynight together. And when shes old enough to read ill be handing down my Naruto and Naruto Shippuden Manga to her to enjoy as i did. Naruto and Naruto Shippuden has been a huge part of most of my life and i just cant see myself walking away probably ever. Although the series has not completely ended yet, I did love the series from the beginning. The character development was brilliant. And the plot was very smooth... until fillers started to corrupt the social structure of this series. I just wished the fillers were limited to only one for every 50 episodes, but that may be but a fairy tale. The plot itself is very unique. Same thing goes with the fighting styles, which are something you may have never seen before in any other anime. I recommend watching from the very beginning, but i shall warn you that there will be an excessive number of fillers. So much that you might give up on the whole series altogether. They have screwed this anime up, I no longer watch this anime because of what they have done to it. Yay! its time to watch naruto.. ahhh.. fillers..Yay! its time to watch naruto.. ahhh.. fillers..Yay! its time to watch naruto.. ahhh.. fillers..Yay! its time to watch naruto.. ahhh.. fillers..Yay! its time to watch naruto.. ahhh.. fillers..fillers..fillers..fillers..fillers..fillers..fillers..fillers..fillers..fillers..fillers..fillers..fillers..fillers..fillers..fillers..fillers..fillers..fillers..fillers..fillers..fillers..fillers..fillers..
Oh wait I think its no longer Naruto Shippuuden, its Naruto Filler. Whats today's special episode.. yes you have guessed it, FILLER! WOW :O Watch this anime because well you can get all the fillers u WANT. -Flashback of a scene in the beginning of the SAME EPISODE. I have trouble sleeping so I put on fillers and they put me to sleep. Only thing its good for. My title pretty much sums it up the stars but I'll go with some extra points. The anime overall is very good. Plenty of action and character development, ridiculous and awesome fights/powers. The problem is the stupid amount of fillers. If you are binge watching then you probably won't notice, but once you catch up you will be at a point like me where the past 3-4 months have been pure fillers that interrupted the middle of a damn war, even though there is already plenty of written content for them to make REAL episodes. This show started on a strong note and can boast a few years of strong content, but as time went on it got more cheesy and less interesting and now we're at a point where it's just fillers with a story once in a while. Truly sad to say, but not worth the effort.